Erika Brown is worked hard and overcame all obstacles to become a proud graduate of Paul Mitchell School, an American Board Certified Haircolorist, and a Makeup Specialist. She works at a salon she loves and specializes in hair coloring and the art of special occasion styles. 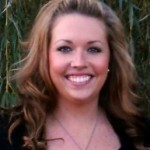 She runs her own cosmetology blog, Confessions of a Cosmetologist, and enjoys inspiring others in the cosmetology field. You can also keep up with Erika on Facebook. 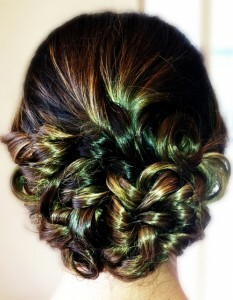 Do you ever get that sunken feeling when you get an updo client but have no idea what you’re doing? Or maybe you’re the type that jumps for joy and can’t wait for the challenge. I want everyone to get that excited feeling when an updo is booked, and the most important reason is this: Anyone coming to a salon for an updo is more than likely preparing for a special day or event. Would you want to see a stylist that isn’t confident about styling and struggles through it with an attitude? Heck no! You might be the kindest and most talented girl in the salon…but it won’t matter. Clients can see that look on our face….when they know you’re clueless….and you both know it! In my opinion the key to any happy client is a thorough consultation, whether it is an updo or a cut. You may be confident as a stylist but if you don’t get a clear vision of what the client wants…you will not succeed. Most people are unhappy because it was not what they asked for….don’t stop asking questions until you feel like you’re on the same page. The following is a list of questions that I always ask during an updo consultation. It’s important because that bride-to-be probably chose a style months ago and you don’t want to be the one to give her the opposite….don’t rain on her wedding day! 1. What are you looking to get done today? This seems too broad but it’s important because it tells you how much the client has thought about what she wants. If she is unsure…you know you’ve got lots of questions to ask. If she’s gung-ho on a particular style but says, “I do want this, and maybe I don’t like that, etc.”, then you’ve got to dig deeper. Ask her what she does or doesn’t like about every point that she touched on. What they say after the first question is so important. Those are the things that concern her the most….if you get those points right you will have a happy client. Did you bring any pictures or would you like for me to make a few suggestions? Pictures have earned a horrible reputation when it comes to clients whipping them out at a consultation. I have heard several stylists say, “Oh no, she brought pictures… I hate that!” They are forgetting that without them you are left to rely on your conversation and their ability to explain what they want alone to come up with the updo hairstyle on the spot. If a client brings more than one photo you should compare them, narrow down the options. Tell your client, for example, “Two of the styles you’re showing me are half-up and the other two are completely up. Which one do you prefer?” This gives you a chance to let them know that they are sending mixed signals and makes them pick specific details out. A brief conversation or just glancing at a photo without asking any questions is asking for trouble. Always cover your back, if you ask and perform you will find a new spurt of confidence! How much can a girl complain after you went out of your way to be so thorough? 3) What style is the neckline of your dress and are you wearing any accessories? This gets their mind off the worries of the style and gets them talking. It’s so hard to get direct details at times and anyone will chit chat about what they will be wearing! It also helps to break the ice if you have a shy client or get them feeling more comfortable with you. You can also determine if the style they want will look good with what they plan to wear. You don’t want to cover up a beautiful neckline by leaving some of the hair down or leaving them too bare around the neck if they aren’t wearing any accessories. 4) How would you like the front to look? Most people will show you a photo of the back of an updo…but not the front. Don’t corner yourself…I always start in the back but I’m sure to leave what I need to create the desired look in the front. Surprisingly, it matters just as much as what they requested in the back. I like to ask if they want to keep their usual part or do something straight back. This is HUGE because it greatly alters their look…and what’s in all the pictures? The front…not the back…both should look great but for different reasons. 5) Would you like the back to be centered or to the side? Low, middle, or high on the head? If someone doesn’t bring you a photo this is a great tidbit to check on. It also goes hand-in-hand with the accessories that they want to wear. If someone is wearing stunning earrings, a middle updo is great because there is no hair behind them. When wearing stud-like earrings or none at all I like to suggest a side style because it adds something around the neck. Surprisingly, not everyone asks this question and it can change the whole look. In my experiences I get more requests for mid to low updos. High updos are rare these days unless it’s a ballerina or someone performing. Obviously, if they want a high updo it will probably not be on the side! 6) How much volume do you want? Would you like it at low, mid, or high crown? Have you ever made the mistake of assuming someone wants volume just because so many people ask? I certainly have….and clients look like they saw a ghost when you go overboard and they weren’t expecting any extra volume! Or maybe you leave that part out completely and they look flat on top. Again, if there’s no photo you’ve got to ask….how much volume would you like? There are many ways to create volume but knowing where to start is the key. Some styles require volume at the high-crown area and some look best at the low-crown. It all depends on what type of look you are trying to create! 1) To assure that you are doing the best you can to understand and perform what the client is asking. If you are not clear about the desired look and the client is unhappy then how will you know what you forgot to ask? It’s also a great time to be honest and say, “I’m not great at incorporating braids into updos…do you mind if a fellow stylists steps in to help?” Then you don’t have to sweat and the client will feel even more pleased because you admitted that they are asking for a skill that you don’t feel comfortable with. It’s a special day….anyone would rather you let go of the ego and work together for their sake! 2) To help yourself better understand where you went wrong and how to fix it. When the client says, “It’s just not what I wanted and I really don’t like how high it is on my head,” what next? It’s not like you can undo it or fix it really quick! Usually we don’t have time and besides, what a mess that would be. Knowing where you messed up when you know you did your best is the surest way to build your skills and have clients leaving happier every time! Keep in mind that you don’t always need to ask everyone each question and sometimes you’ll need to ask some of your own. It’s impossible to tell you everything you should touch on….the more you practice this method the better you will get. Don’t cut corners on the updo consultation. Knowing all of the details is the first and most important step! Last updated by admin at May 15, 2013 . This entry was posted on Thursday, May 9th, 2013 at 8:00 am	and is filed under Hair Design. You can follow any responses to this entry through the RSS 2.0 feed. You can leave a response, or trackback from your own site.